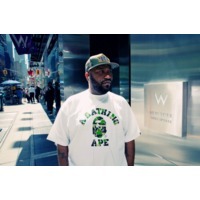 Bernard James Freeman (born March 19, 1973) better known by his stage name Bun B, is an American rapper and was one half of the southern hip hop duo UGK. He is also a guest lecturer at Rice University located in Houston, Texas. He recently released his third official solo album Trill OG on August 3, 2010, which received a 5 Mic "Classic" rating in The Source Magazine - the first album in over five years to receive the honor. Bun B is married with two stepchildren.